Sewing with heavy fabrics like denim, leather and fabrics for draperies and slipcovers requires durable equipment that is designed for the job. If you're working with any of those heavier fabrics then you should consider buying a heavy duty sewing machine. If you want to jump to a specific sewing machine or see our recommendations right away use the table below. For shopping advice and detailed reviews you can just scroll down and check out our buying guide. Learning advanced sewing skills means investing in a machine that will provide smooth performance on heavy fabrics. Trying to work on heavy fabrics with a machine that wasn't meant for it will be frustrating and difficult. A lot of people try working with heavy fabrics and give up out of frustration without realizing that all they needed to succeed was a more heavy duty sewing machine. Let's take a look at each one and understand what they mean. Since a heavy duty sewing machine needs to pass the needle through thicker fabric, the number of stitches per minute is important. Smaller sewing machines meant for light fabrics will struggle and won't be able to achieve the same SPM that a heavy duty machine can handle. There are many different types of fabric and you need to make sure that the sewing machine you pick can handle those fabrics. For example, if the machine is going to be used for leather clothing, you might need to choose a specific model that can handle that fabric. If you don't check that it is compatible, you could find yourself limited later on down the line when you move on to new materials. Most heavy duty sewing machines are heavier and made of thicker metal than their lightweight counterparts. That doesn't mean you should be rough on your sewing machine, but don't be afraid to get in there and control the fabric how you need to in order to get clean stitches on the heavier fabrics. If you aren't familiar with handling heavy duty materials you can find your machine being kicked around due to the force on the fabric. A heavy duty sewing machine will have extra weight to counteract these jolts and make sure that your work area is stationary and stable. This is something that you can take for granted until you work with a machine that's difficult to thread. The best thing to do is check what other reviewers have said and use their personal experience to guide your choices. What may be a very easy threading for one person could be difficult for someone else so you'll have to go off your past experience with different models to be able to make a comparison. If you don't have past experience and you're buying your first machine just try to read as much as possible before making a selection. User reviews are always going to give you the widest pool of knowledge and make it easier to choose. Do I Really Need a Heavy Duty Sewing Machine? The question of whether you really need a heavy duty sewing machine depends on your range of sewing skills, the sewing projects planned and the volume of work. Certainly, sewing hobbyists who use a sewing machine for large projects in high volume need a heavy duty sewing machine. These type machines are work horses and built to last. There's no worry about fabric weight or fabric sizes. Virtually any large sewing pattern for the biggest projects requires a heavy duty sewing machine. Sooner or later, there's always a pair of denim jeans that need mending and that compact model sewing machine just can't manage it. Most of the top rated machines on this list are light enough in weight to make them quite mobile. When the PTA needs the stage curtain mended for the next student play, a heavy duty sewing machine travels well and can work magic. There's always a need for a heavy duty sewing machine for alterations like newly purchased drapes that are too long or too wide for a non-standard size window. In less than a half hour, alterations can be made on a heavy duty sewing machine that would take hours on a regular compact machine. Mending torn leather or suede jacket sleeves is another reason to consider one. So without furter ado, here is our list of the top 5 rated heavy duty sewing machines. 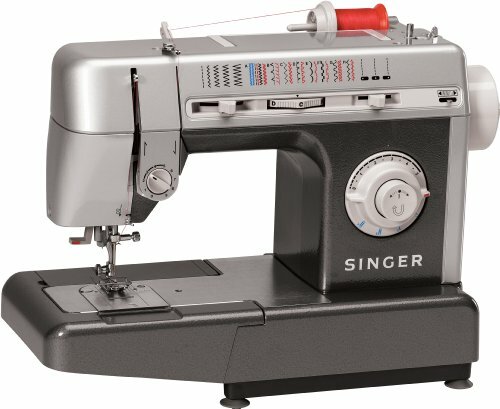 The #1 most popular machine for large sewing projects is the Singer 4423 Heavy Duty Extra-High Sewing Speed Sewing Machine. It features a metal frame and stainless steel bedplate, and can handle 1100 stitches per minute. It has a total of 23 different stitches from which to choose. You can tell that this sewing machine was made for heavy sewing projects with its durable metal frame which helps with keeping the machine stable when working with heavy fabric. If you'd like to read our full review of the Singer 4423, you can check it out here. The Janome HD3000 has 18 Built-In Stitches is a great machine for someone who is more than a casual hobbyist. 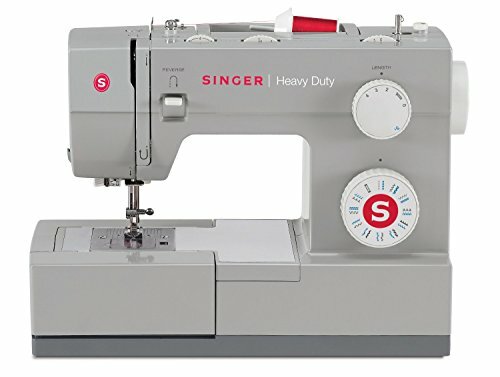 This is a great machine for those really big sewing projects. Janome HD3000 will perform as well as an industrial sewing machine but is made for the at home sewer so it's easier to use. Able to handle up to seven layers of fabric for draperies and slip covers. Another great feature on this machine is the bobbin system. It's top loading and jam proof. This means it is much easier to handle and makes the sewing machine more beginner friendly. 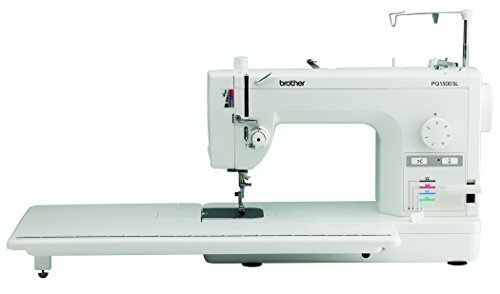 Although the Brother PQ1500S model is listed as a high-speed straight-stitch and quilting machine, it handles large sewing projects and thicker fabrics with ease. 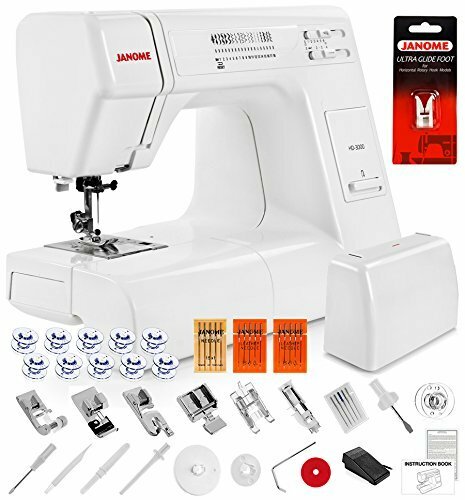 It performs well with an SPM (stitches per minute) of 1500 and four feed dog settings, the advanced sewing hobbyist can look forward to completing their most complex sewing projects. The Brother PQ1500S weighs 24.2 pounds and is 12.6" W × 7.9" H × 19.3" D in size. It also comes with a 25-year warranty and Brother stands behind their products 100%. The Juki TL2000QI comes in at #4 on our list. 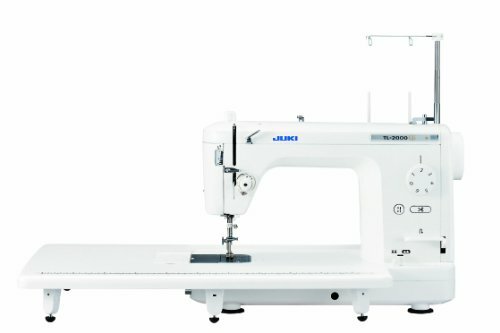 The Juki TL2000QI features a single needle lockstitch for straight stitching and quilting. The TL2000QI has an extended sewing area which makes it easier to work with large pieces of fabric. The Juki TL2000QI High Speed sewing machine produces 1500 stitches per minute and has a thread tension scale for convenience. In addition, this machine offers a 6 mm stitch length for heavy duty fabrics and quilts. The second Singer model to make the top five list is the Singer CG590 Commercial Grade sewing machine. If it's not obvious already, there's a lot of reasons for Singer to be on this list twice. They are well known for their high quality sewing machines and the GC590 carries on that tradition in a nice, commercial grade model. It weighs 16 lbs. and is sized at 16 x 7 x 12.5 inches. It has a heavy duty metal frame and produces 1100 stitches per minute. It comes with accessories like spool caps, a pack of needles, bobbins, and multiple feet to tackle a variety of tasks. With 18 built in stitches, this Singer is a solid model for professional work. Compared to a Pfaff, Singer is a 1962 Corvair sitting next to a Rolls Royce. My pfaff is beat after 8-10 years of service. I keep taking it in for repairs but they don’t last. My brother, meanwhile, is happily sewing away on his new, cheaper singer heavy duty. Sounds like a tutorial on Pfaff routine maintenance is needed for some. I have a 2056 Pfaff and it is a workhorse. It’s slow speed torque is second to none of those listed. My Kenmore, Sears, was bought new 1977. Love it. Had to finally retire it because parts are no longer available. Had it repaired once. Now it is done. Made clothes for six children and nieces and nephews. All metal machine not some cheap foreign made parts. I don”t need a machine that is throw away like most appliances are now. Landfill is full of these things. Sad Hate to give my Kenmore up. I need a new heavy duty machine that doesn’t cost me an arm and leg to repair jeans, clothes, curtains etc. for my grown kids and grandkids. Hi every one, I need help. I can’t decide which sewing machine is better for me. I work with different fabrics from silk to heavy fabric. Can somebody help me with the name of the machine that would work best for me? Totally wondering the same thing, need to do leather, denim, draperies, slacks, zippers…. What can do everything on occasion, make the change fairly simply and not break the bank? Suggestions?